In this case the white streaks do appear to be on top of the avalanche debris, which is different than the paper I reference above. 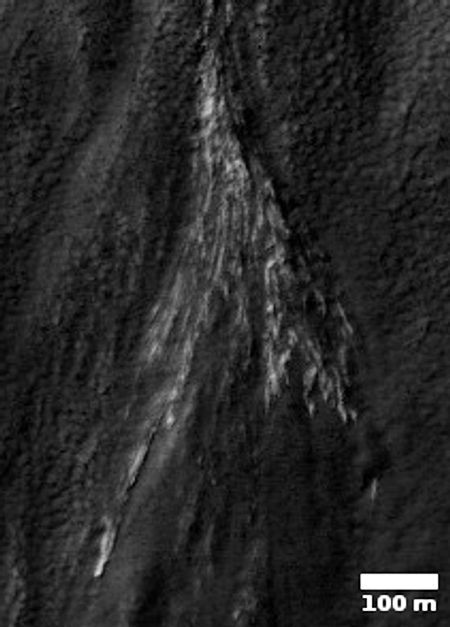 There, the streaks looked more like exposed white areas on the smooth slopes above the debris. This difference might explain why the scientists here think this is frost, not exposed buried ice/snow. 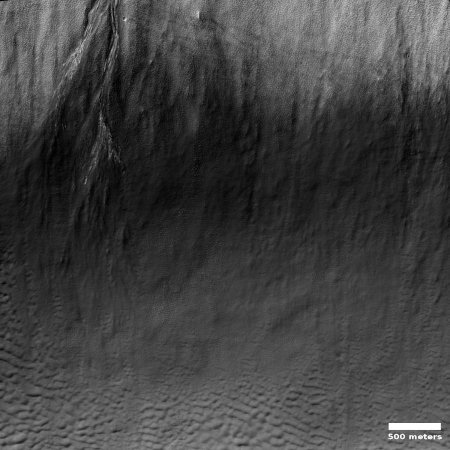 That water frost can settle on the surface of Martian slope is intriguing. The slope is in the southern hemisphere and is south facing, which means this slope gets considerably less sunlight. This cold environment will allow frost to gather and remain. I wonder if there is enough of this kind of frost for future colonists to be able to use. At a minimum, I could see such frost as a survival tool. Imagine you are a Martian prospector, out in the wild, looking for resources you can mine. This frost might be an easy source of water in a very dry desert environment. Science fiction writers take note! This is a good catch, there are deep gullies and ravines eroded at the top of the picture which deposits like a delta on top of the avalanche debris. This is where the ice occurs in the picture. I would note that this also could be salt deposits from evaporated ice/or water from seepage in the crater wall. At the bottom of the original picture appears to have mudflows with more frost/salt on the leading edges (or the gravity side) of the dunes at the bottom of the slope. Lots of dust devil tracks indicates warm/cold dynamics occurring in the crater. 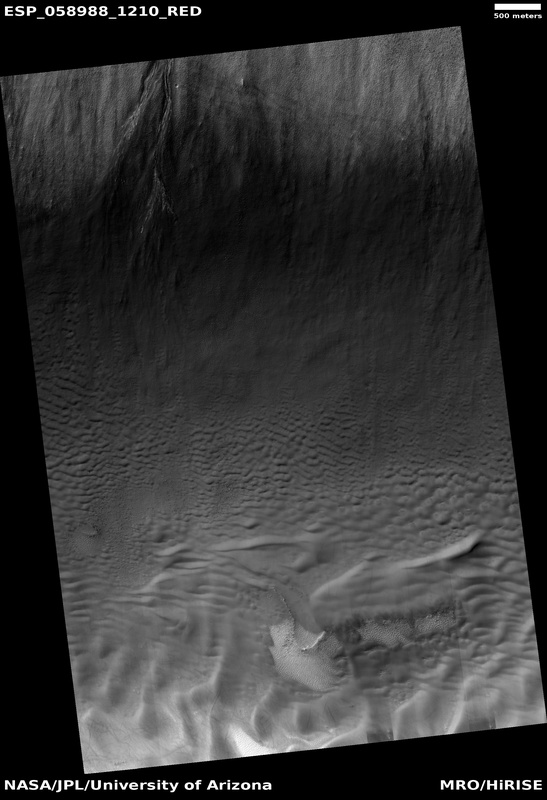 The most significant part of the picture is the erosion that formed gullies and delta build up deposits that could not of happened without a “fluid liquid” at some point of Mars history. The evidence for subterranean water is strong.